The Victorian government's forestry arm will face a legal challenge over claims it illegally logged old-growth forest and increased the risk to a threatened species. Environmental groups accuse VicForests of felling dozens of pre-1900 ash eucalypts, breaching the Central Highlands Forest Management Plan. An impending legal case will also claim the timber agency failed to protect habitats necessary for the survival of Victoria's threatened faunal emblem, Leadbeater's possum. Ecologist Jacques Cop, from consultants Acacia Environmental Group, said a survey of just one coupe near Toolangi found 31 pre-1900 ash eucalypts had been logged. Five stumps were more three metres across. ''These are trees that are 200 or 300 years old,'' he said. Mr Cop said the area should also have been protected as a Leadbeater's possum habitat as it met the threshold of having at least 12 hollowed trees within three hectares. He said neither the state Department of Sustainability and Environment nor VicForests carried out ground surveys to check if ecological requirements were being met. Sarah Rees, president of local group My Environment, said the situation was an emergency. ''If this doesn't stop we're going to lose the last viable habitat for a range of different species, but Leadbeater's possum carries the strongest case for legal protection,'' she said. The state government said it took the allegations ''extremely seriously''. Spokesman Michael Sinclair said VicForests would investigate the alleged breaches and report to the Department of Sustainability and Environment. VicForests spokesman David Walsh said the agency carried out detail planning before harvesting to ensure it acted within the law and had offered to meet local residents to better understand their concerns. ''No old-growth forest is harvested by VicForests in Victoria's central highlands region,'' he said. The legal case, being prepared on behalf of a group called the Flora and Fauna Research Collective, comes amid community concern about the scale of logging in the central highlands after the Black Saturday bushfires. The Wilderness Society said that evidence supporting the latest claims showed illegal logging of native forests was rife under the state government's watch. A separate allegation of illegal logging at Brown Mountain, in east Gippsland, is the subject of a pending Supreme Court judgment. ''Premier Brumby must act now to end VicForests' woodchip rampage in Victoria's magnificent native forests,'' said Wilderness Society spokesman Luke Chamberlain. Yarra Ranges Council is putting its weight behind a community push to stop native forest logging within the shire. At a packed meeting on June 23, residents from Toolangi and Healesville heard from council representatives and environmental lobby and conservation groups. 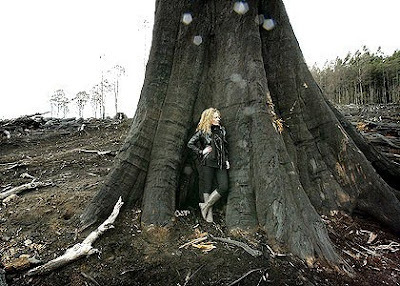 Lyster ward councillor Samantha Dunn told the audience of more than 300 at Healesville Memorial Hall that the forestry industry’s claim that it was a “significant driver of the Yarra Ranges economy” was a myth. She said the industry contributed $24 million annually - .02 per cent - to the local economy and accounted for 91 of the 35,000 jobs in the shire. “Timber workers should have a job but it is time to (move) to plantation logging and get out of our native forests,” Cr Dunn said. She was joined by councillors Tim Heenan, Jeanette McRae and Noel Cliff. Event organiser Steven Meacher said logging had already proceeded at sensitive sites that were approved after Black Saturday. “The Department of Sustainability and Environment is considering VicForests’ application for 148 more coupes, with a decision expected soon,” Mr Meacher said. Healesville resident Bernie Mace said he was concerned about an application for further logging coupes on Mt St Leonard. “I want the profile of the mountain to be respected and retained by VicForests,” Mr Mace said. He said the proposed logging was at the base of the mountain, which was at the start of the Bicentennial National Trail, a world-renowned 5330km trail. Wilderness Society’s Victorian forests campaigner Luke Chamberlain said clear felling - the type of logging done in parts of Yarra Ranges - was akin to vandalism. Mr Chamberlain said native forest logging was an unsustainable industry both environmentally and economically and that it was time to look to plantation logging. On June 8 councillors voted to write to politicians and call for an immediate halt to logging and future logging on the Bicentennial Trail and Mt St Leonard. 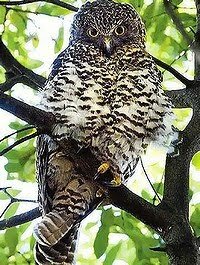 WHAT'S happened to Victoria's carnivorous owls? A significant number have vanished, and the Department of Sustainability and Environment isn't sure what's going on. It's assumed the top end of the woodland food chain is either starving to death because its food source has been killed off by the drought and fires, or it is relocating to parts unknown, but it will take years to find an answer. The DSE has been monitoring the owl populations - including that of the powerful owl, Australia's largest owl - since 2000. Since then, detection rates in South Gippsland and the Bunyip State Park have dropped by half. In some areas of the Bunyip State Park - half of which was lost to the Black Saturday fires - detections of the sooty owl have dropped to a third. Powerful and sooty owls, both officially listed as vulnerable, mainly eat sugar gliders and ringtail possums. The possums in particular are known to have little resistance to chronic hot weather, and their failure to thrive in the drought is probably the main reason why owl numbers have dropped. While owls may have escaped the Black Saturday fires, many possums would have been incinerated. Mr McNab says the smaller carnivorous birds, such as the barking owl, are able to sustain themselves on insects. Powerful and sooty owls can also eat rabbits and birds such as magpies and kookaburras, but they need to make the change in their diet before energy loss reduces their ability to effectively hunt. ''They'll either starve or take something else,'' said Mr McNab. Equally disastrous for the owls was the loss of old trees with large hollows that they require for nesting. They might have shifted elsewhere to recolonise, but this would mean taking over an already occupied territory. ''And there tends to be a home-ground advantage in these battles,'' said Mr McNab. The occupying bird has inside knowledge of the territory and a greater capacity to defend its patch, because it's energy store will be higher. Flying great distances in search of food saps the strength from large birds and even causes them to starve. It will take years to find out what's happened. ''And not just three or five years. We'll be out here for a long time,'' said Dr Willig. AUSTRALIA has been accused of trying to cheat its way out of reducing its greenhouse gas emissions by pushing for ''dishonest'' forestry accounting loopholes at the latest round of UN climate talks. Along with Russia and the European Union, Australia is facing claims it is pushing to change rules so they could include offsets from planting trees but not count emissions created by land clearing. Developing countries and environmental groups at the two-week meeting in Bonn, Germany, said rich nations were attempting to give the impression that they were tackling climate change when in reality they would be undermining genuine cuts. The dispute centres on what year, or series of years, are chosen as a baseline to measure emissions from the land and forestry. The Climate Action Network, a coalition of more than 500 environment and development groups, said a proposed revision of the land use, land use change and forestry rules would falsely exaggerate emission reductions. ''It's a disgraceful scandal. It would be disastrous for the climate,'' said Sean Cadman, an Australian spokesman for the climate network. The deputy chief executive of the Climate Institute, Erwin Jackson, said Australia's credibility was ''teetering on the edge of an abyss'' after the government's decision to delay emissions trading and the Coalition's outright opposition to a scheme. ''Obstinacy against reasonable calls for Australia to take responsibility for pollution from forestry is counterproductive and the government risks being perceived as trying to cook the books,'' he said. A spokeswoman for the Climate Change Minister, Penny Wong, said the government measured and reported emissions from forestry and the land in accordance with international rules and reported them clearly every year. ''Australia recognises that the world needs smarter treatment of human-caused emissions from the land sector,'' she said. The climate network claims that loopholes could account for nearly 400 million tonnes of carbon dioxide, or nearly 5 per cent of the global total. Forest management is seen as key to the climate talks because it is the biggest source of carbon credits and potential mitigation.